I have done 72 beers of the week so far, allowing me to taste a research beers from around the world. Then it occurred to me that I have not featured a beer from my own backyard. 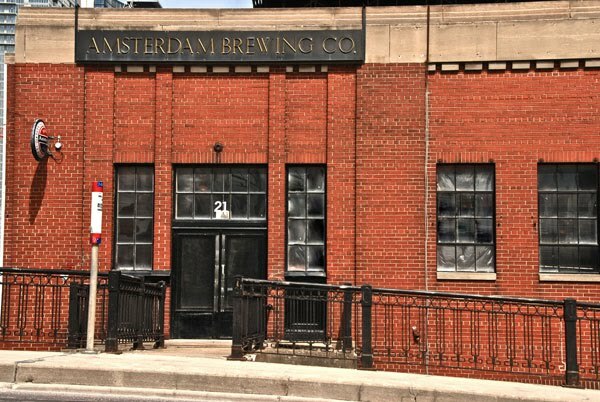 Amsterdam Brewery is located at the foot of Bathurst St, one I can drive to in 5 minutes or walk to in 15. So to start our vacation, Teena and I walked on over to do the tour. Only it wasn't a tour. Turns out that the brewery cannot do tours in the summer due to the number of people wearing open-toed shoes or sandals. It becomes a safety issue as being a brewery, there can be glass shards on the floor. No matter, instead of a tour, we received a tasting of several of their brews. Amsterdam Brewery opened in 1986, when Roel Bramer decided to open Toronto's first brewpub on King St. Being from the Netherlands, he decide to name the brewpub after the city where he was born calling it The Amsterdam Brasserie and Brewpub. In 1993, he moved to King and Portland continuing to run the brewpub, but in 1993, dec ided to sell off the brewpub and concentrate on brewing beer only, and called his brewery The Amsterdam Brewing Company. In 2002, Bramer sold the company to Jeff Carefoote, who decided a year or two later to move to a larger space at it's present location. Amsterdam Blonde and Big Wheel Amber are their biggest sellers. The Blonde is a little too sweet for me. Big Wheel Amber is a good tasting beer. I was really excited to hear that they had recently brewed a hoppy 7.1% IPA, so stopped on in and picked up some. The beer comes in a brown 500ml bottle, with a fun label, a skeleton riding a bike. It pours a cloudy brown colour, due to this being an unfiltered ale. I twice poured the beer with a two-finger slightly tanned head which dissipated fairly rapidly to about a half finger. The head held both times at that point. Nice lacings did remain along the inside of the glass, showing the quality of the malt. I do note the hops in the aroma. Citrus comes through o n the first taste and rapidly the ale becomes bitter with a long, beautiful hoppy bitter finish. This IPA is reminiscent of the West Coast Style IPA, highlighting the hops throughout, but always maintaining an excellent balance with the malt. This is a fabulous beer! Hopheads will love this one and I am a hophead. It has been awhile since I have paid my local brewery a visit but now that this is in their fridge, Amsterdam brewery is going to see me around more often. Note: During the tasting, Teena enjoyed the Amsterdam Framboise, made with real B.C. raspberries and came home with a four pack of this. I returned home with four Boneshaker IPA. It was an enjoyable afternoon at the brewery. Here I am by the fermenters. A few of the tasters. Brent in the black shirt is manning the taps for us. See the frost. This is where they cold filter the beer.